Our Groomer, Kim, works Monday - Friday. Grooms are by appointment only! Groom dogs are to be dropped off between 7:30am and 8:30am, they are usually ready to go after 3pm but you have until 6pm to pick them up. Kim will also give you a call to let you know when your dog is done. If you are dropping off your dog for the first time we ask that you come closer to 8:30am, if possible, to talk to Kim in person. All animals getting groomed must show proof of Rabies and Distemper vaccines. We offer cat grooming but if the cat won't cooperate or is being extremely difficult we will give you a call and let you know that we are unable to groom your cat. We do not want your cat or any employees to get hurt. Grooming includes a bath, ear cleaning, toenail trimming, and the cut/style of your choice. A price increase may also occur if you are looking for a more elaborate hair style like a fancy pattern on a poodle or if your dog is matted. There is a fee for extra combing/brushing. The price of the groom is at the discretion of the groomer. Kim also offers a discounted price for puppies first groom. 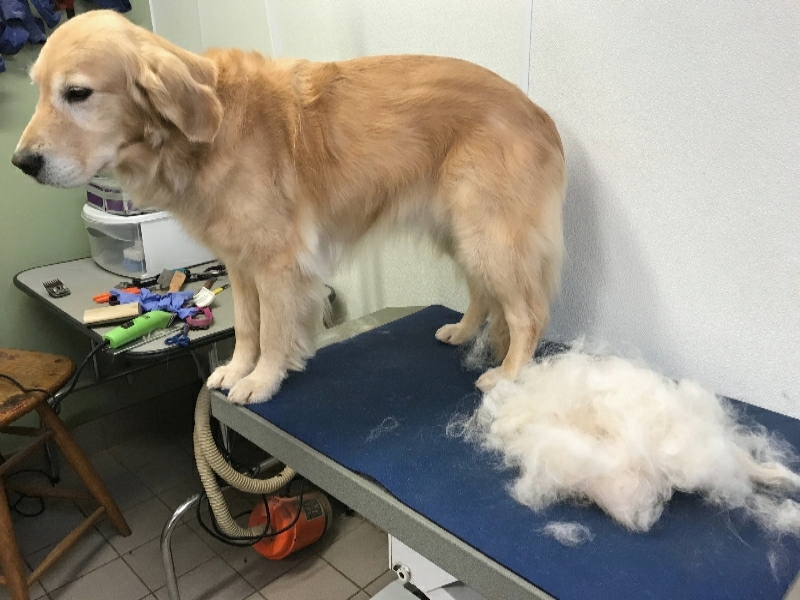 A first groom generally consists of a bath and trimming of their face and feet. It is always a good idea if you own a breed that will need to be groomed often to get them started when they are young. Kim also offers discounted pricing if you just need a bath and brush-out or their face/feet trimmed in-between your regular groom. Poodle Pricing- If you are looking for one length all over, no clean feet/face and topknot. It will be closer to the base price depending on the condition of the dog. If the you are looking for a more in-depth cut, like clean face and feet, some sort of pattern there may be an additional $10 to $15 to base price. *We do not guarantee that the skunk smell will be completely gone, it all depends on how badly your dog has been skunked, it might take a couple of baths. Kennel Baths by Appointment: Kennel baths are done by the staff not the groomer. If you would likethe groomer to give your dog a bath the price is different then these posted below.